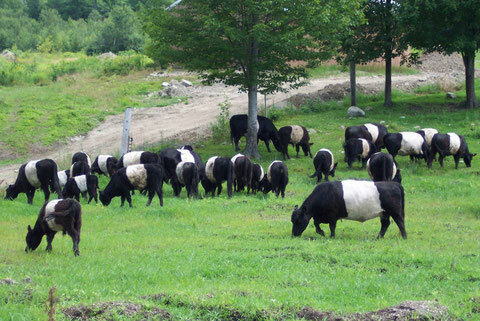 We have been raising Registered Belted Galloway cattle for over 20 years. Our beef is grass fed and lightly finished with organic grain for maximum flavor and tenderness. Our beef is sold by the “side” and custom cut at an inspected processing facility to your specifications. Call for availability and pricing. Today's health conscious society wants a product low in fat yet tender, juicy and flavorful. These needs are being met in Belted Galloway beef. Carcass comparisons made in 1994 by A.R.C. Butson, M.D., of Maple Brae Farms, Hamilton, Ontario, Canada, between a half-dozen purebred Belties and an equal number of commercial beef cattle, placed the Belted Galloway Beef low in saturated fat content as well as total fat average, and indicated high ratios of Omega 6 to Omega 3—the beneficial lineolic and linolenic acids.